I love a cozy dinner this time of year, something warm and simple, but still hearty and satisfying. Daylight is in short supply, but meals that feel comforting and nourishing can help compensate for the otherwise dreary nature of what is happening outside. This season is full of hustle and bustle, too. Parties and errands dominate the calendar, so something that comes together quickly for dinner is a must. In short, this time of year, I make gallons of soup. Soup tends to dirty a minimum amount of dishes, include a good balance of nutrients all in one bowl, is warming and hearty, and provides endless opportunities for creativity and variation. I especially love to serve soup the evening before a holiday, since it is easy to make and the ingredients do not tend to take up too much room in the fridge and pantry. One of my favorite January traditions is “soup bowl Monday,” in which I make a pot of soup the day after the Super Bowl. The pared-down nature of that meal serves as a perfect recovery for the indulgences of game-day treats the day before. I don’t usually think of soup as party food, simply because it is generally served as a first course and the kind of entertaining I do typically does not involve anything quite so formal. I changed my thinking about soup served to company, however, after going to a holiday lunch at the home of a friend. Soup was the main course and was served in a festive way. She offered a tomato-based soup that included a delicious and savory mixture of ground beef, sausage and seasonings. 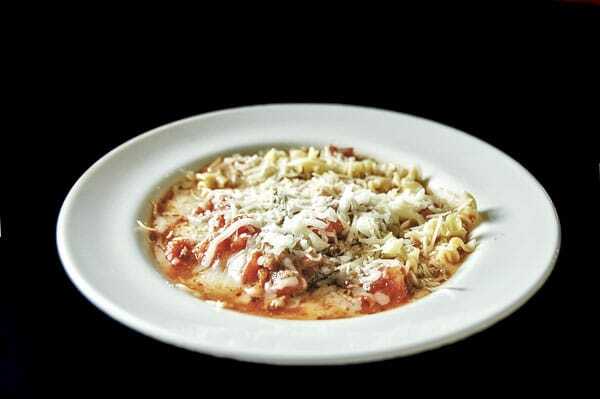 To that soup base, guests could add noodles and three kinds of cheese. The soup was delicious and festively red, and because the hostess could prepare absolutely everything ahead of time, she wasn’t chained to the stove while she entertained. 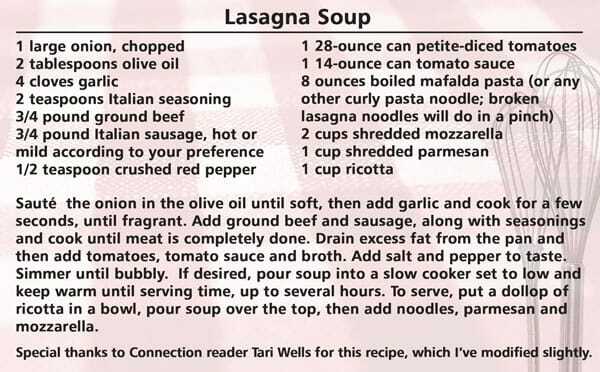 This soup, which tastes very much like lasagna (but takes a fraction of the time to put together) contained component parts, which allowed guests to pick and choose their favorite way to eat it. Chicken tortilla soup would work in much the same way; a chicken soup base could be offered with rice, tortilla chip strips, mashed avocado and shredded cheese. Served in pretty bowls with crusty bread and a platter of cookies, this “DIY” soup is a fun way to feed a crowd. Soup for the holidays is a great way to bring people together without wearing yourself out. And because you can make a large batch, there will likely be a bit left over to look forward to for lunch the next day. It’s the gift that keeps on giving.